Figure 1. DL8 system concept. M-System's model DL8 is a remote terminal unit with basic web server function. 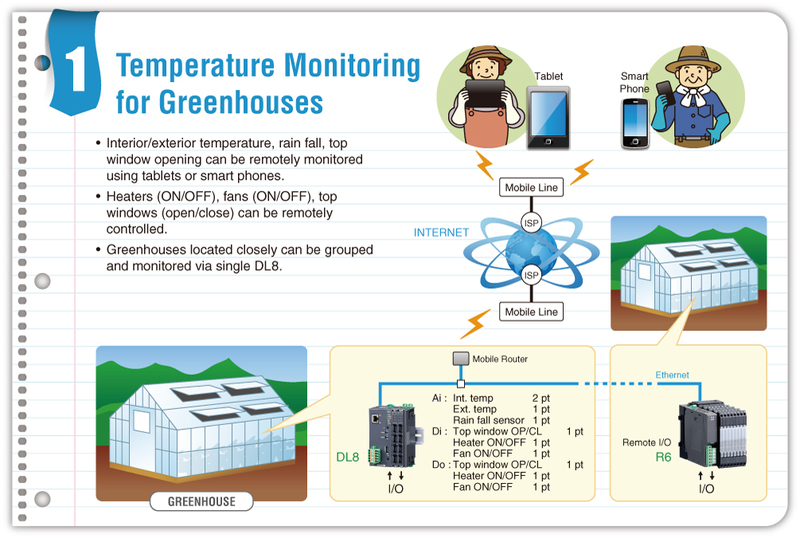 Various sensor signals are gathered from built-in I/O modules or remote I/Os connected through Ethernet Modbus/TCP, and monitored through Intranet or Internet using a web browser (Figure 1). Users do not need any additional application program to view the data. User-friendly browser views are already installed: Data, Trend and Event Log views (Figure 2). Each one is basic but useful, designed for ease of browsing on a small screen of smart phones and tablets. Data can be also uploaded to a cloud server or a PC by FTP, so that multiple users can access it at once without overloading the local DL8 module. Local data logging in CSV format is available by using an SD card memory, thus the DL8 functioning as a stand-alone data logger. Figure 2. Web browser views. Each signal channel is available with alarm threshold setting to trip alarm contact outputs by adding discrete output modules for buzzers and lamps. 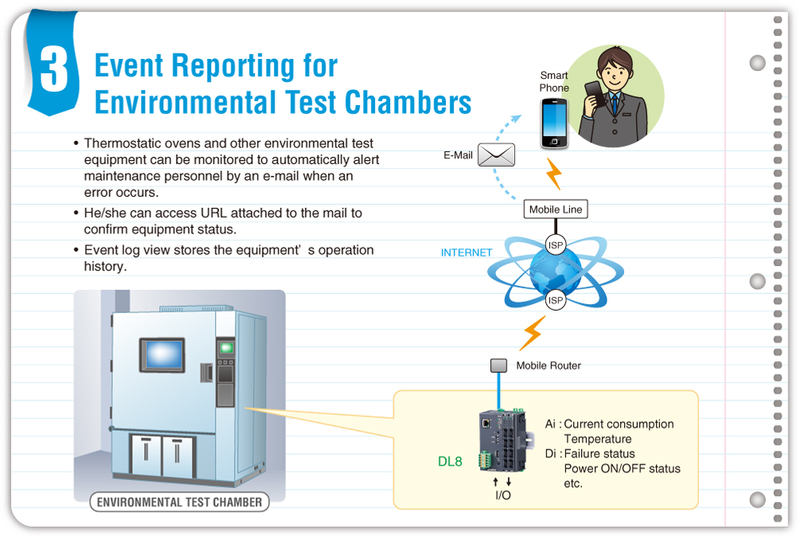 E-mailing with a preset message attached with event data is also possible. Mails can be used for regular reporting purposes, too. At the maximum of 32 analog signals, 64 each of discrete inputs and outputs, and 32 pulse signals can be handled by one DL8 module. M-System's remote I/O model R7E, R3-NE1 and other Modbus/TCP slaves can be connected. Modbus RTU devices such as Multi Power Monitor L53U are connected through a gateway unit (model: 72EM2). I/O data is assigned by using only general address information (IP address, node number and channel), so that other manufacturers' I/Os are also usable. 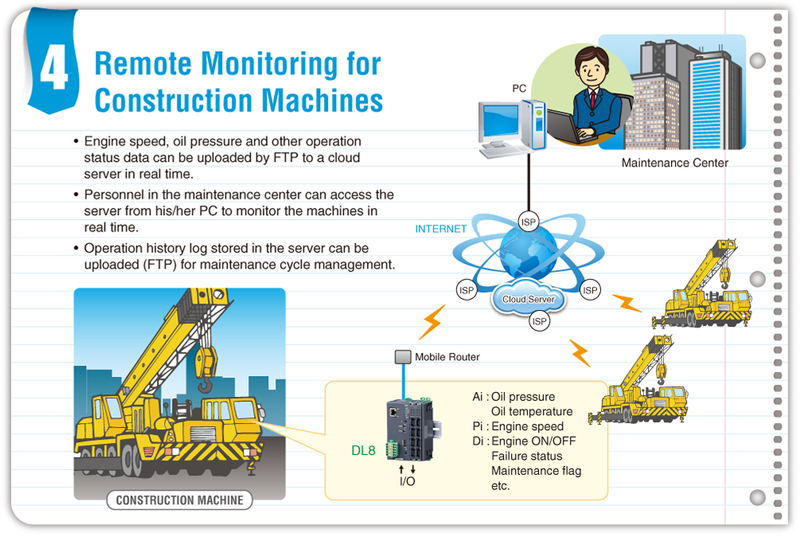 The DL8 functions as Modbus master to collect data from remote I/O, while it functions as Modbus slave when a supervisory monitoring system (SCADA) polls data of the DL8 (Figure 3). Figure 3. DL8 as Modbus master and slave. Network, I/O, web server, mail, FTP, logging and other parameters are set up by using the PC Configurator Software model DLCFG, connected either locally via a special cable (models: MCN-CON or COP-US) or remotely via network. Mail address and texts can be managed on a smart phone or tablet via internet. 24V DC ±10%, approx. 12W at max. 1.6A output, Ripple 10%p-p max. 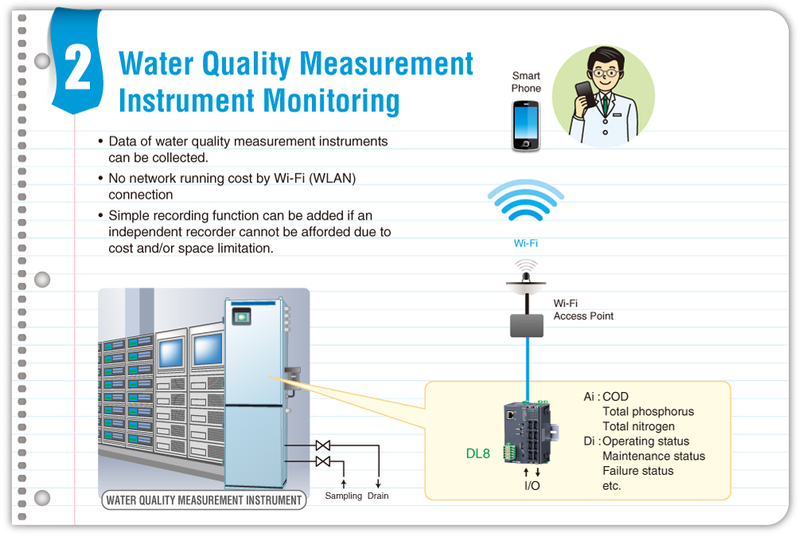 The DL8 is used to monitor various devices (compressor, storage, dispenser, etc.) used in a CNG (Compressed Natural Gas) gas filling station to alert operating errors, gas leaks, pressure or temperature abnormalities, by automatically sending e-mails to PCs at the central monitoring station or mobile phones carried by service personnel. Service personnel can access web browser views to check real-time operating status and related pressure and temperature data. The operator in the central monitoring station can access local stations regularly to collect logged data.